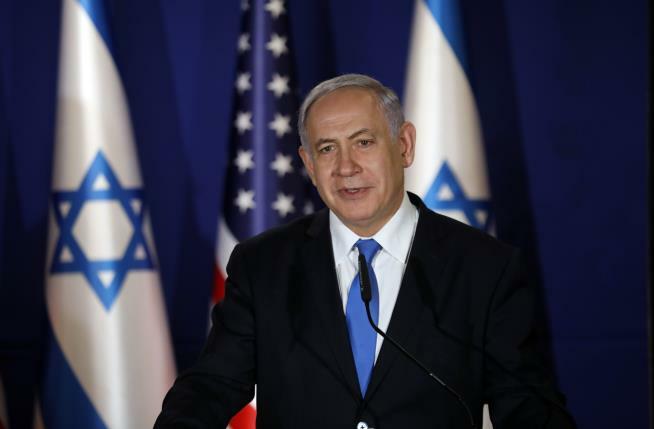 (Newser) – A rocket attack will shorten Benjamin Netanyahu's visit to the US. The Israeli prime minister arrived in the US on Sunday and met with President Trump as planned on Monday in the White House. But Netanyahu will skip a planned address to AIPAC and immediately return home instead of staying for another two days, reports Reuters. The change comes after the Israeli military said a rocket fired from Gaza struck a home near Tel Aviv and wounded seven people. It is the furthest a Palestinian rocket has traveled into Israel since strife in 2014, notes the BBC. Israeli forces blamed Hamas and responded Monday by striking targets across the Gaza Strip, including the offices of Hamas' supreme leader, the AP reports. If there is one thing you can rely on in the Middle East: It's that Mossad agents in Gaza will always fire rockets — just in time to reelect Netanyahu. If dual loyalties are not the problem, and if the U.S. Government is indeed not controlled by Israel's cousins here in the U.S. -- then why is everything just being handed to Israel without pressure being applied on them to stop colonizing Palestinian land? Aside from sucking up $4 billion of our tax dollars annually, rhere is no evidence that these people are our "friends." Why then is Mr. Trump their prostitute? That is the question.